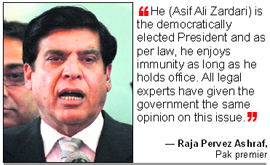 Facing the July 12 deadline to respond to the Supreme Court's order to reopen graft cases against Asif Ali Zardari, Pakistan's new Premier Raja Pervez Ashraf has defended the President's immunity, saying it would only end after he leaves office. Pakistan has secretly allowed US-led NATO forces to use its airspace to transport lethal supplies to Afghanistan while disregarding a resolution approved by Parliament that set conditions for the movement of supplies, a media report said today. Pakistan Tehreek-i-Insaf chairman Imran Khan has been declared as the country’s most popular leader based on the findings of a survey conducted by the Global Attitudes project of PEW Research Centre. Al-Qaida is plotting to blow up an American airliner in the run-up to this month's London Olympics and has trained a Norwegian Muslim convert in an attempt to evade airport security, a media report said today. Masked attackers killed at least 17 persons on Sunday in gun and grenade attacks on churches in a Kenyan town used as a base for operations against Al-Qaida-linked insurgents in Somalia. Militants from the Al-Qaida-linked Ansar Dine group destroyed mausoleums of Sufi saints with guns and pick-axes in the famed Mali city of Timbuktu for a second day, said witnesses on Sunday, ignoring international calls to halt the attacks. Dozens of protesters shouted and danced at the gate of a nuclear power plant set to restart today, the first to go back online since all reactors were shut down for safety checks following the Fukushima nuclear disaster. Ohi nuclear plant's reactor No.3 is returning to operation despite a deep divide in public opinion. Last month, Prime Minister Yoshihiko Noda ordered the restarts of reactors No.3 and nearby No.4, saying people's living standards can't be maintained without nuclear energy. A new way of powering gadgets using simply a person's own body heat has been developed by an American company that specialises in green power sources. This week at a technology show in New York City, Perpetua was showing a new way of powering gadgets, Fox New reported Saturday. Meet the grandfather of all Britons: Ian Kinnaird, a 72-year-old retired lecturer of Scotland is directly descended from the first woman on Earth, who lived some 190,000 years ago, researchers claim. Three years ago a group of five Indian workers arrived in Ghana to make a living at a local steel company located near the capital of this West African nation. But today they have ended up as paupers and living on their neighbours' benevolence. "He (Zardari) is the democratically elected President and as per law, he enjoys immunity as long as he holds office," Ashraf told reporters last night. He said all legal experts had given the government the same opinion on this issue. On Wednesday, the Supreme Court gave Ashraf time till July 12 to indicate whether he would ask the Swiss authorities to reopen graft cases against Zardari. Ashraf's predecessor Yousuf Raza Gilani was convicted of contempt and disqualified by the apex court after he refused to act on orders to revive the corruption cases against Zardari. Both Gilani and Ashraf have contended that the President enjoys immunity from prosecution within Pakistan and abroad. The Supreme Court has been pressuring the government to revive the cases against the President since December 2009, when it annulled a graft amnesty issued by former military ruler Pervez Musharraf that had benefited Zardari and over 8,000 others. Asked specifically whether he would write to the Swiss authorities to reopen the cases against Zardari, Ashraf said he would announce his decision on July 12. Immunity is enjoyed not only by the Pakistani President but all Presidents of the world, he said. The question of Presidential immunity has been blown out of proportion though there is no ambiguity on the issue, Ashraf said. "If there is no right decision, it can create chaos in the country. Therefore, we should avoid such decisions and take appropriate decisions that do not damage the country," he said. In this regard, he said that when the judiciary was attacked in the past, all political parties and the people came out to defend it. If something similar happens to Parliament, people will come out to save it, he added.Ashraf said the uncertainty prevailing in Pakistan is harmful to institutions and undue importance given to a single issue might be detrimental to democracy. "Institutions should work within their Constitutional ambit and let people decide about the future of the democratically elected government since it is they who matter," he said. It was not clear when permission was granted for transporting the lethal supplies but the arrangement is believed to be a stop gap one between Pakistan and the US till they finalise a deal on reopening land routes to Afghanistan, official sources were quoted as saying by The Express Tribune. Islamabad: A US drone targeted a compound in the lawless North Waziristan tribal region of Pakistan on Sunday, killing eight suspected militants, officials said. The CIA-operated spy plane fired two missiles on the compound in Shawal area, 50 km from Miranshah, the main town of North Waziristan Agency, officials were quoted as saying by TV news channels. The move could trigger a strong public backlash in view of the resolution passed by a joint session of Parliament that states Pakistan's territory, including its airspace, will not be used to transport arms and ammunition to Afghanistan, the report said. The Foreign Office and the Defence Ministry were at odds over allowing NATO planes to carry weapons, a source was quoted as saying by the daily. The Foreign Office opposed the decision, considering it a violation of the Parliamentary resolution. However, it started issuing non-objection certificates to such planes after pressure from defence authorities, the report said. According to rules, the Foreign Office forwards the non-objection certificates to the Pakistan Air Force, which allows the aircraft to fly over Pakistan. However, an unnamed senior Foreign Ministry official denied the Foreign Office had any part in granting the permission. The official said the Foreign Office's role was that of a "post office" and it was the Defence Ministry and concerned authorities that are supposed to determine and grant permission for planes carrying weapons. According to the survey, seven out of ten Pakistani respondents offered a favourable opinion about Khan, while the favourable ratings for the leader increased by 18 percentage points over the past two years. 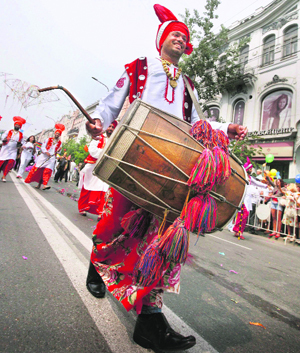 The survey also revealed that Khan enjoys incomparable popularity among the youth. President Asif Ali Zardari’s popularity went significantly down to 14 per cent as compared to 64 per cent in 2008, and popularity of PML-N chief Nawaz Sharif dropped to 62 per cent from 79 per cent in 2009. Al-Qaida in the Arabian Peninsula (AQAP) has trained the Norwegian convert and is understood to have also selected a target, believed to be a US passenger jet, The Sunday Times quoted intelligence sources as saying. "The Norwegian recruit goes under the name of Muslim Abu Abdurrahman. He is understood to be in his thirties and a 'clean skin', with no previous criminal record," it said. "He converted in 2008 and quickly became radicalised. He later travelled to Yemen, where he has spent several months, to complete his training," the paper said. The plot confirms fears among US and British intelligence agencies that al-Qaida is seeking to recruit radicalised westerners in an attempt to evade airport security, it said. The Norwegian was believed to have been in the southeastern town of Azzan, the longtime home of the AQAP, until last month. He then moved to Dammaj, a town in the north. The new plot is the terror group's fourth to be detected since 2009, when the AQAP sent a Nigerian-born British student on a plane with an underpants bomb. The bomb failed to detonate over Detroit and the man was arrested and jailed. In 2010, it sent two bombs hidden in printer cartridges on cargo planes destined for Chicago. They were intercepted and defused in Dubai and Britain, the paper said. Two months ago, a third plot was averted when a British undercover agent, who had infiltrated the AQAP, volunteered to be a suicide bomber. He smuggled out the latest version of the sophisticated underpants bomb to US authorities. "There is terrorist plotting going on irrespective of the Olympics (from July 27 to August 12). The only thing that connects this to the Olympics is the fact that they are about to happen," said a Whitehall official. The intelligence officials said the latest plot should be seen in the context of Al-Qaida's continuing ambitions to blow up American planes. The AQAP has no history of targeting Britain. However, that did not mean British citizens were not at risk. "If you are blowing up aeroplanes you are likely to be killing Brits or having a big impact on the European or British economy. [So it] would in effect be an attack against Britain," the official said. At least 45 persons were wounded in the simultaneous attacks on Garissa, in the north of the East African country which has suffered a series of blasts since sending troops into Somalia last October to crush Somalia's Al-Shabaab militants. "We have 17 bodies at the mortuary so far," regional medical officer Abdikadir Sheikh told Reuters. There was no immediate claim of responsibility. The police said they suspected the attacks could have been the work of Al-Shabaab sympathisers or bandits, but it was too early to say. Inside Somalia, the Al-Shabaab declined comment. "The goons were clad in balaclavas," regional deputy police chief Philip Ndolo told Reuters from Garissa. The Salafist Ansar Dine backs strict sharia, Islamic law, and considers the centuries’ old shrines of the local Sufi version of Islam in Timbuktu to be idolatrous. Sufi shrines have been attacked by hardline Salafists in Egypt and Libya in the past year. The group has threatened to destroy all of the 16 main Sufi mausoleum sites in Timbuktu despite international outcry. UNESCO Director-General Irina Bokova has called for an immediate halt to the attacks. Local journalist Yaya Tandina told Reuters that about 30 militants armed with Kalashnikovs and pick-axes destroyed three mausoleums of saints on Sunday. "They had armed men guarding the door. Just like yesterday, the population did not react. They (local people) said we need to let them (the Islamists) do what they want, hoping that someday we will rebuild the tombs," Tandina said. Dozens of protesters shouted and danced at the gate of a nuclear power plant set to restart today, the first to go back online since all reactors were shut down for safety checks following the Fukushima nuclear disaster. Ohi nuclear plant's reactor No.3 is returning to operation despite a deep divide in public opinion. Last month, Prime Minister Yoshihiko Noda ordered the restarts of reactors No.3 and nearby No.4, saying people's living standards can't be maintained without nuclear energy. Many citizens are against a return to nuclear power because of safety fears after Fukushima.Crowds of tens of thousands of people have gathered on Friday evenings around Noda's official residence, chanting, "Saikado hantai" or "No to nuclear restarts." Protests drawing such numbers are extremely rare in this nation, reputed for orderly docility and conformity. 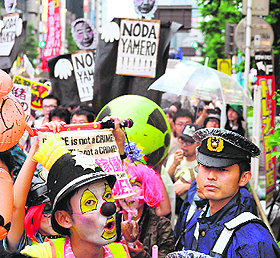 A demonstration in Tokyo protesting the restart and demanding Noda resign was being organised in a major park today. Although initially ignored by mainstream local media, demonstrations across the country have grown, as word gets out through social media such as Twitter, sometimes drawing Japanese celebrities, including Nobel Prize-winning writer Kenzaburo Oe and Ryuichi Sakamoto, who composed the score for "Last Emperor". All 50 of Japan's working reactors were gradually turned off in the wake of last year's earthquake and tsunami, which sent Fukushima Dai-ichi plant into multiple meltdowns, setting off the worst nuclear disaster since Chernobyl. But worries about a power crunch over the hot summer months have been growing. Oil imports are soaring. 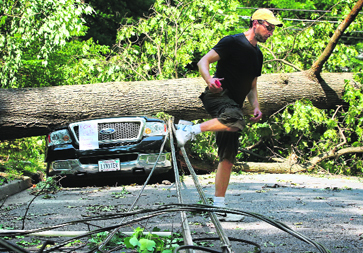 Officials have warned about blackouts in some regions. It's not, strictly speaking, a new way. The technology is based on a principle discovered nearly 200 years ago by physicist Thomas Johann Seebeck. Seebeck found that a combination of materials, when warmer on one side and colder on another, produces electricity. Current heat wave notwithstanding, the human body's temperature of around 98.6 degrees Fahrenheit is usually hotter than the air around it. So Perpetua has developed an armband, soon to become a wristband, that produces enough power for small electronics - not smartphones, but items such as Bluetooth devices. Headsets using a technology called Bluetooth Low Energy need only about 2 volts, said Jerry Wiant, vice president of marketing at Perpetua. What else uses that level of power? A traditional watch does, he said, as do medical and fitness devices such as heart monitors. Perpetua's first products are for the US government. The Department of Homeland Security's Science & Technology division, for example, is funding a power-conducting jacket to monitor the health and safety of first responders - with sensors for heart rate, breathing rate and levels of pollutants such as carbon monoxide. Kinnaird, who undertook a DNA test to find out where his ancestors came from, was stunned when it was found that he inherits a genetic marker from his mother that traces his ancestry to an African lineage that has not been found before in Western Europe. Researchers, who carried out the tests, said in genetic terms, the result meant that Kinnaird was a "thoroughbred", and could be described as the "grandson of Eve, or the grandfather of everyone in Britain". They were so surprised by the results that they phoned Kinnaird, a widower who lives in the far north of Scotland, and told him that his mitochondrial DNA (mtDNA), which passed through the female line, was 30,000 years old and only two genetic mutations removed from the first woman. Most men have a genome with around 200 mutations since the earliest humans.